When Bobby turns sixteen years old, he finds out that his girlfriend, Nia, is pregnant. The book alternates between past and present, weaving a tapestry of heartache and love. It is at first unclear why, but Bobby is alone in raising his daughter, Feather. Bobby struggles to maintain some sense of normalcy in his life. He still attends school and hangs out with his best friends, J.L. and K-Boy, but he finds that his life is irrevocably different. His lack of sleep makes it difficult to stay awake in class, and he can no longer act irresponsibly alone or with his peers. This becomes vividly apparent after Bobby is apprehended for committing an act of vandalism in a moment of despair. As Bobby begins to adjust to his new role as a father, he must make important decisions regarding his future. An unexpected opportunity allows Bobby to change his destiny and start anew with his daughter. The First Part Last is a poignant coming of age story told from the rare perspective of a teen father. Bobby’s evolution as a character is astonishing considering the conciseness of the text. The narration of Bobby’s character feels honest and genuine. The realities of fatherhood are not glamourized in any way, and it is clear that Bobby’s choices in life have forced him to grow up very fast. The reader can sympathize deeply with Bobby, as the emotions portrayed are very raw. His love and adoration for his daughter is very endearing, and despite the difficulty of his situation, the reader is left with a sense of optimism and hope. This book truly drives home the sense that doing what is right is never easy. Bobby accepts the consequences of his choices head on and strives to do right by his daughter. In a sense this book is a cautionary tale, but at no point does the author beat the reader over the head with antiquated morals. It is a smooth and insightful read. Sixteen year old Bobby was like any other boy his age, until an unplanned pregnancy and tragedy left him a single parent. Bobby adores his baby girl, but he still has some serious growing up to do. 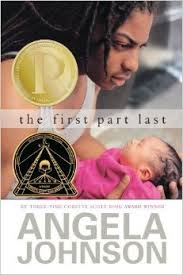 According to the author’s website, “Angela Johnson is an award winning American children’s book and poetry author with over 40 books to her credit. She began her writing career in 1989 with the publication of a picture book called “Tell Me a Story, Mama” which won the Ezra Jack Keats New Writer Award in 1991. She has won three Coretta Scott King Awards, one each for her novels “The First Part Last (2004),” “Heaven (1999),” and “Toning the Sweep” (1994).”The First Part Last” was also the recipient of the Michael L Printz Award. “When I Am Old With You” was an Honor Book in 1990 and named an American Library Association Notable Book. “The Other Side, The Shorter Poems” was also selected as a Coretta Scott King Honor book in 1998. In recognition of her outstanding talent, Angela was named a 2003 MacArthur Fellow. Aside from being an assigned reading, this book is an award winning book with a realistic depiction of teen issues. Bobby is a believable character and his first person perspective makes him very relatable to teens.